The reason pirates wore eye-patches was not because they were always getting poked in the eye, but because they were constantly going above deck (where it was bright) to below deck (where it was dark). And in order to preserve their “night vision,” they would keep one eye in darkness so it could see better below deck. Isn’t this blog just the coolest? For today’s post, we’re going to talk about how you read these posts. And while the topic may get a little “biological” at times, bear with me. For if I were to ask what you knew about the sense you depend on more than any other, what could you honestly tell me? Inside your eye you have two types of photoreceptors, or in other words, two types of cells that are able to turn light into electrical signals for your brain. The first type of photoreceptor is called a rod. These cells respond to gray scale distinctions and are hypersensitive to light. 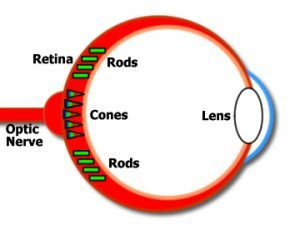 The second type of photoreceptor is called a cone. These cells respond to colors and provide visual acuity (or the “sharpness” of an image). In one eye, you have about 6 million cones concentrated in the middle of it (the fovea) and about 120 million rods surrounding them. Now, because your rods are much more sensitive to light, they’re what you rely on for night vision; however, because they can only distinguish between a spectrum of black and white, that’s why colors are hard to determine in the dark. However, if it’s dark out, looking through the corner of your eyes actually allows you to see the most detail—because your peripherals are where your rods are concentrated and those are the photoreceptors that respond to dimmer lights. For example, imagine you were looking at the night sky and you kept seeing a star appear in the corner of your eye but disappear every time you try to focus on it. Because your peripheral vision (where the rods populate) is more sensitive to light, it can “pick up on” those weaker light rays, or in this case, a dim star, than the focus of your eye can. Because your rods are so sensitive to light, however, they “shut off” when it gets too bright, and take about 20 minutes of darkness to fully turn back on. Knowing all of this, then, the next time you wake up in the middle of the night to use the bathroom, “do the pirate” and close one eye before you turn the lights on, so you’ll still have all your rods “active” in one eye when you go to move about in the darkness afterward. Aren’t you so glad you know me?